THERE are two birds, which, although wild and unapproachable at every other time, throw themselves during the breeding-season on the mercy and protection of man : these are the wood-pigeon and the missel-thrush. Scarcely any bird is more wary than the wood-pigeon at other times, yet in the spring there are generally half-a-dozen nests in the most exposed places close to my house, while the old birds sit tamely, and apparently devoid of all fear, close to the windows; they seem to have an instinctive knowledge of places where they are allowed to go through the business of incubation without being molested. In like manner, the missel-thrush, though during the rest of the year it is nearly impossible to get within a hundred yards of it, forms its nest in the apple-trees close to the house : they build at a height of six or seven feet, in the fork of the tree where the main limbs branch off; and although their nest is large, it is so carefully constructed of materials resembling in colour the bark of the tree, and is made to blend itself so gradually with the branches, as to show no distinct outline of a nest, and to render it very difficult to discover; and this bird, at other times so shy and timid, sits so close on her eggs that she will almost allow herself to be taken by the hand. The missel-thrushes on the approach of a hawk give a loud cry of alarm, and then collecting all their neighbours, lead them on to attack the common enemy, swooping and striking fearlessly at him, till he is driven out of the vicinity of their nests. The observation of the different plans that birds adopt to avoid the discovery and destruction of their eggs, is by no means an uninteresting study to the naturalist. There is far more of art and cunning design in their manner of building than the casual observer would suppose, and this, even amongst the commonest of our native birds. The wren, for instance, always adapts her nest to the colour and appearance of the surrounding foliage, or whatever else may be near the large and comfortable abode which she forms for her tiny family. In a beech-hedge near the house, in which the leaves of the last year still remain at the time when the birds commence building, the wrens form the outside of their nests entirely of the withered leaves of the beech, so that, large as it is, the passer by would never take it for anything more than a chance collection of leaves heaped together, and though the nest is as firm and strong as possible, they manage to give it the look of a confused mass of leaves, instead of a round and compact ball, which it really is. 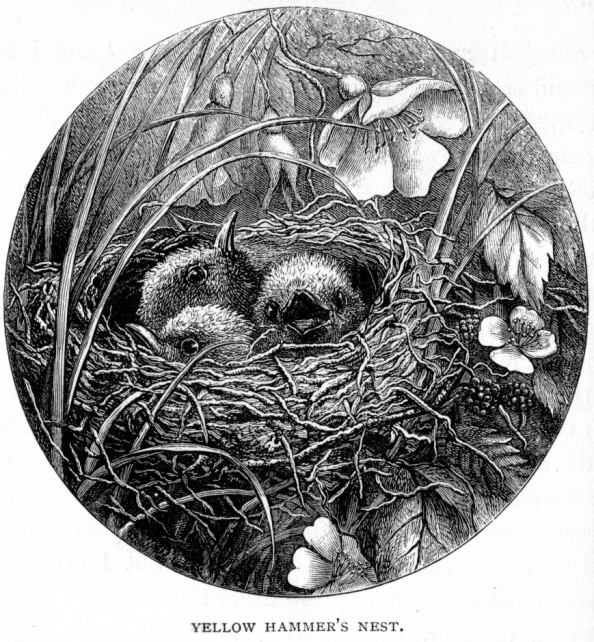 The wren also builds near the ground, about the lower branches of shrubs which are overgrown and surrounded with long grass : in these situations she forms her nest of the long withered grass itself, and twines and arches it over her roof in a manner which would deceive the eyes of any animal, excepting those of boys. When her nest is built, as it often is, in a spruce fir-tree, she covers the outside with green moss, which of all the substances she could select is the one most resembling the foliage of the spruce : the interior of the wren's nest is a perfect mass of feathers and soft substances. The chaffinch builds usually in the apple-trees, whose lichen-covered branches she imitates closely, by covering her nest with the lichens and moss of a similar colour. Even her eggs are much of the same hue. Sometimes this bird builds in the wall-fruit trees, when she collects substances of exactly the same colour as the wall itself. The greenfinch, building amongst the green foliage of trees, covers her nest with green moss, while her eggs resemble in colour the lining on which they are laid. The yellow-hammer, again, builds on or near the ground, and forming her nest outwardly of dried grass and fibres, like those by which it is surrounded, lines it with horsehair; her eggs too are not unlike in colour to her nest—while the greenish brown of the bird herself closely resembles the colour of the grass and twigs about her. 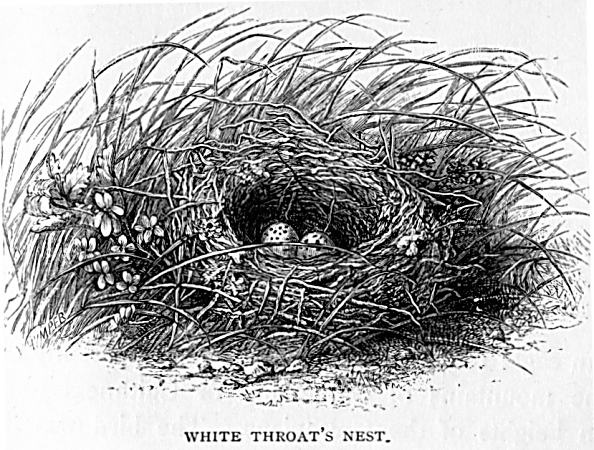 The little whitethroat builds her nest on the ground, at the root of a tree or in long withered grass, and carefully arches it over with the surrounding herbage, and to hide -her little white eggs, places a leaf in front of the entrance whenever she leaves her nest. When the partridge quits her eggs for the purpose of feeding, she covers them in the most careful manner, and even closes up her run by which she goes to and fro through the surrounding grass. The same plan is adopted by the wild duck, who hides her eggs and nest by covering them with dead leaves, sticks, and other substances, which she afterwards smooths carefully over so as entirely to conceal all traces of her dwelling. There are several domesticated wild ducks who build their nests about the flower-beds and lawn near the windows—a privilege they have usurped rather against the will of my gardener. Tame as these birds are, it is almost impossible to catch them in the act of going to or from their nests. They take every precaution to escape observation, and will wait for a long time rather than go to their nests if people are about the place. The peewits, who lay their eggs on the open fields with scarcely any nest, always manage to choose a spot where loose stones or other substances of the same colour as their eggs are scattered about. The terns lay their eggs in the same manner amongst the shingle and gravel. So do the ring-dottrel, the oyster-catcher, and several other birds of the same description; all of them selecting spots where the gravel resembles their eggs in size and colour. Without these precautions, the gray crows and other egg-eating birds would leave but few to be hatched. The larger birds, the size of whose nests does not admit of their concealment, generally take some precautions to add to their safety. A raven, who builds in a tree, invariably fixes on the one that is most difficult to climb. She takes up her abode in one whose large size and smooth trunk, devoid of branches, set at defiance the utmost efforts of the most expert climbers of the village school. When she builds on a cliff, she fixes on a niche protected by some projection of the rock from all attacks both from above and below, at the same time choosing the most inaccessible part of the precipice. The falcon and eagle do the same. The magpie seems to depend more on the fortification of brambles and thorns with which she surrounds her nest than to the situation which she fixes upon. There is one kind of swallow which breeds very frequently about the caves and rocks on the sea-shore here. It is almost impossible to distinguish the nest of this bird, owing to her choosing some inequality of the rock to hide the outline of her building, which is composed of mud and clay of exactly the same colour as the rock itself. In fine, though some birds build a more simple and exposed nest than others, there are very few who do not take some precaution for its safety, or whose eggs and young do not resemble in colour the substances by which they are surrounded. The are of the common rabbit, in concealing and smoothing over the entrance of the hole where her young are deposited, is very remarkable, and doubtless saves them from the attacks of almost all their enemies, with the exception of the wily fox, whose fine scent enables him to discover their exact situation, and who in digging them out, instead of following the hole in his excavations, discovers the exact spot under which they are, and then digs down directly on them, thus saving himself a great deal of labour. The fox chooses the most unlikely places and holes to produce her young cubs in; generally in some deep and inaccessible earth, where no digging can get at them, owing to the intervention of rocks or roots of trees. I once, however, two years ago, found three young foxes about two days old, laid in a comfortable nest in some long heather, instead of the usual subterraneous situation which the old one generally makes choice of. Deer and roe fix upon the most lonely parts of the mountain or forest for the habitation of their fawns, before they have strength to follow their parents. I one day, some time ago, was watching a red-deer hind with my glass, whose proceedings I did not understand, till I saw that she was engaged in licking a newly-born calf. I walked up to the place, and as soon as the old deer saw me she gave her young one a slight tap with her hoof. The little creature immediately laid itself down; and when I came up I found it lying with its head flat on the ground, its ears closely laid back, and with all the attempts at concealment that one sees in animals which have passed an apprenticeship to danger of some years, whereas it had evidently not known the world for more than an hour, being unable to run or escape. I lifted up the little creature, being half inclined to carry it home in order to rear it. The mother stood at the distance of two hundred yards, stamping with her foot, exactly as a sheep would have done in a similar situation. I, however, remembering the distance I had to carry it, and fearing that it might get hurt on the way, laid it, down again and went on my way, to the great delight of its mother, who almost immediately trotted up, and examined her progeny carefully all over, appearing, like most other wild animals, to be confident that her young and helpless offspring would be a safeguard to herself against the attacks of her otherwise worst enemy. I have seen roe throw themselves in the way of danger, in order to take my attention from their young. No animal is more inclined to do battle for her young ones than the otter; and I have known an instance of an old female otter following a man who was carrying off her young for a considerable distance, almost disputing the way with him, leaving the water, and blowing at him in their peculiar manner; till at last, having no stick or other means of defence, he actually got so frightened at her threats that he laid down the two young ones and went his way. He returned presently with a stick he had found, but both old and young had disappeared. Even a partridge will do battle for her young. A hen partridge one day surprised me by rushing out of some cover (through which I was passing by a narrow path) and flying at a large dog who accompanied me; she actually spurred and pecked him, driving him several yards along the road; and this done, she ran at my heels like a barn-door hen. As I passed, I saw her newly-hatched brood along the edge of the path. I have known a pheasant do exactly the same thing. Wild ducks, snipes, woodcocks, and many other shy birds, will also throw themselves boldly within the reach of destruction in defence of their young.